Top-ranked flyweight Jessica “Evil” Eye has sustained a serious back injury and has been forced to withdraw from her fight against Munah “The Perfect Storm” Holland at Bellator 95 on April 4th in Atlantic City, New Jersey. Eye discussed details of the injury with MMARising.com this weekend. Eye, who has fought through injuries including a broken foot in the past, was left unable to walk or train due to the severity of the back injury. She incurred damage to the sacral vertebrae in her lower back and will undergo shots and therapy in hopes of making her return to the Bellator cage this summer. Eye (9-1-0) ascended to the top of the women’s flyweight division in December when she choked out Zoila “The Warrior Princess” Frausto Gurgel in just 58 seconds at Bellator 83. She had looked to post her seventh straight win in the bout with Holland (5-2-0), but will now be sidelined for an undetermined amount of time. Eye previously fought veteran Angela Magana to a three-round Unanimous Decision victory in August despite competing with a broken foot that had significantly limited her ability to train for the bout. This time, however, Eye knew that she would be unable to fight on. Eye’s back had been giving her trouble during training for nearly four weeks, but it was not until Sunday that the problem became much worse. When her back went out, she was unable to walk or stand up straight. She immediately began cortisone shots and anti-inflammatory shots into the muscles to try to alleviate the condition, which was diagnosed as a damaged S1 vertebrae and SI joint. Eye states that insufficient rest time and stretching may have played a part in the development of the injury. Eye is hoping to be able to make a return to action in the upcoming Bellator Summer Series. 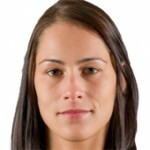 If she cannot get on a Bellator card, she hopes that the promotion will allow her to fight for the Ohio-based North American Allied Fight Series, where she began her career as an amateur in 2008. Eye is also focused on staying active in grappling tournaments if fight opportunities in MMA are limited. Prior to suffering the back injury, Eye had never before pulled out of a fight. Being reliable is a crucial character trait to Eye and she extended condolences to her opponent, Holland, who may now be left without a fight. Eye has been on the other side of the equation on multiple occasions and has endured fight cancellations and changes. However, she knew that it would not be fair to herself, her fans or to her opponent to come into the fight at a level that would be far shy of her best. After a week of anxiety and depression over the injury, including briefly contemplating whether it was worth it to continue on in MMA, Eye says that she has begun to feel better about the situation and is optimistic about the future going forward. Positivity and inspiration to her fans have both been key factors in Eye’s rise to become one of the most popular female fighters in the sport. She has resumed interacting with her many supporters and will soon release a video documenting her injury recovery. Love this girl. Hope to see her fight soon. From everything I know about this girl, both in & out of the cage, she’s really d*mn awesome. Sometimes life lays out obstacles in front of us, and we find ourselves at a fork in the road, a test you might even say. I hope she makes it back inside the cage, and at the time that’s best for her. Jessica, we’re pulling for you.